By law a school must offer a hard-copy prospectus to provide information for prospective parents. Nowadays, the school website, which was rebuilt in August 2017, provides the most comprehensive and up-to-date picture of the school, including all the statutory documents and forms, current timetable, school menus and all the myriad pieces of information about life in school. Nunney First School aims to be economical in its use of resources and this includes paper. Therefore, in practice, the school will only print the prospectus on demand. This means that no paper is wasted and that the prospectus you are given, if you wish to receive it in this form, will be current on the date of printing. 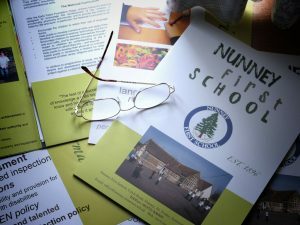 If you would like to receive the printed prospectus for Nunney First School, please contact the school office. Thank you.